Find out what I switched up! My front porch often gets neglected..... I have BIG plans for this awkward space but in the mean time, I'm going to spruce it up a little! I changed up a few things as you will see! Pumpkins will be joining soon! What are your fall porch decor plans?!?! I want to see them! (Before) Large Porch Space - Awkward! We've been waiting on buying a new front door - In the mean time, I painted it cream and repainted the kick board black with spray paint. Grab a little twin and burlap: Since when did this ever hurt anything! (After) Sure, why not a few FAKE plants outside?!?! Pillow Covers - made last year. Why not a little burlap! Had it around the house. Plants $3.99 Ross - already had! (After) Blue planter is still waiting on a fern....When you don't go out your front door, you tend to forget about those kind of things! Feels a little more fall! 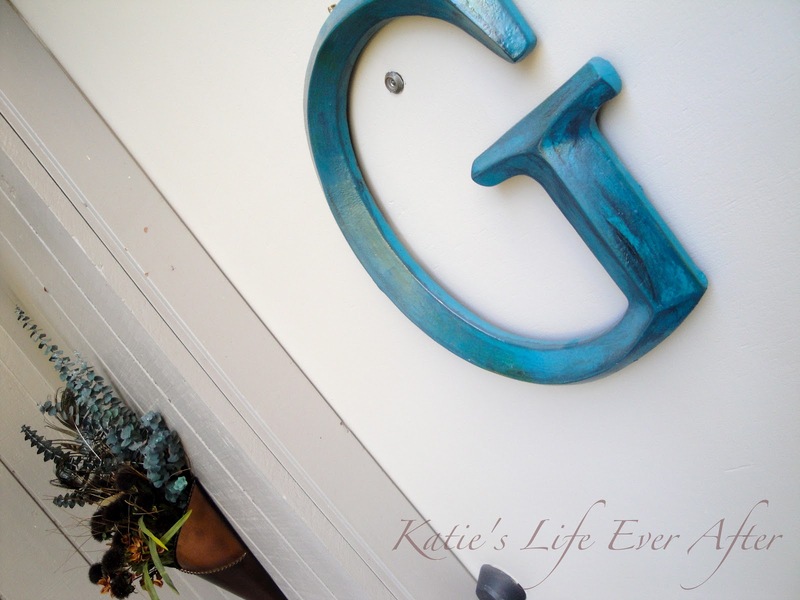 Hubby broke my old turquoise 'G' - That was a sad day (and he denied doing it)! I still love this decor so I thought I would share it! Used an Acrylic turquoise paint from the hobby store. Brushed brown acrylic paint on top (wiped off excess). Sprayed with clear sealant (in the spray paint area). Tell me your plans for decorating your front porch this Fall! Do you switch it up completely or just tweak a few things!?! Lovely blog! You have the cutest ideas! I know that you love walking in your house with such a beautiful entrance! You did a wonderful job!